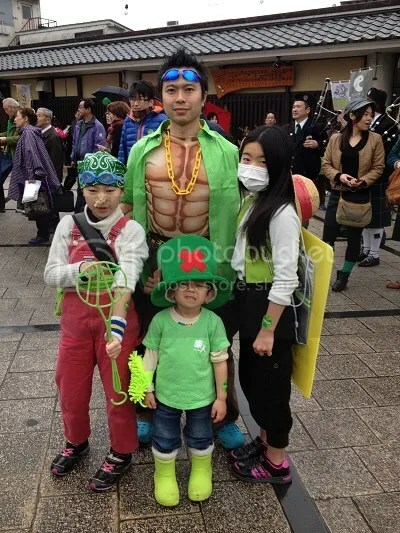 St. Patrick’s Day, Japanese style! 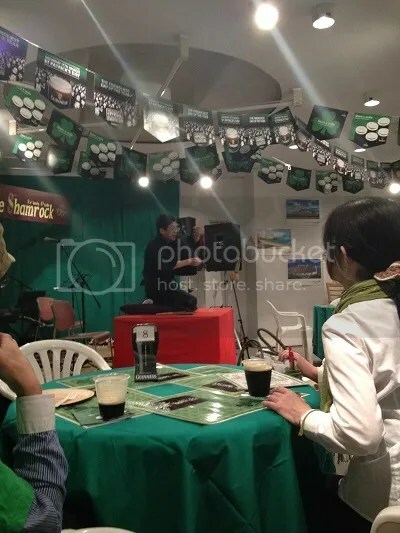 Tokyo is having their parade this weekend, but Matsue’s Irish Festival–one of the biggest Irish celebrations in Japan outside of Tokyo–was held last weekend. Like any good parade, it looked like it was going to get rained on, but we managed to only start the day in Irish-style rainy weather, and by the time we marched the rain let up. Evidentally there were enough people with enough Irish blood to give us the luck we needed. 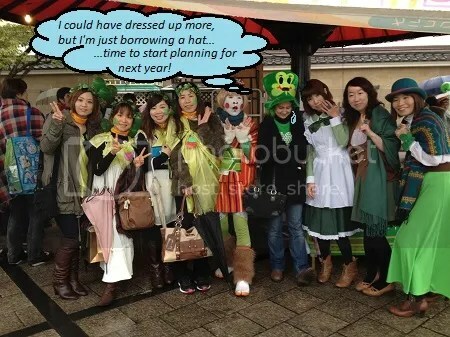 Besides the foreign community this event tends to bring out of the wood works and yours truly, we had some full-blooded Irish visitors from Tokyo–the Irish Ambassador and his wife. One of the other notable part-Irish people around here is Prof. Bon Koizumi, Lafcadio Hearn’s great-grandson. 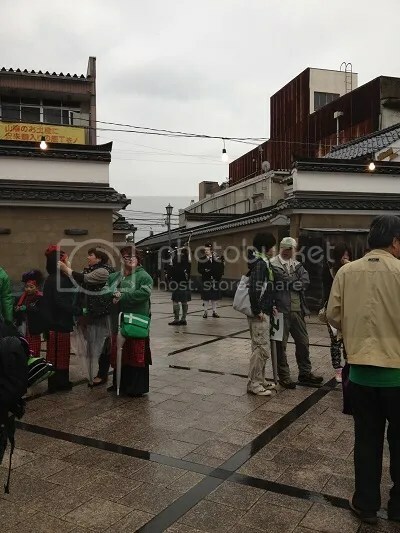 It is because of Lafcadio Hearn’s influence on Matsue that the city maintains a relationship with the city of Dublin. 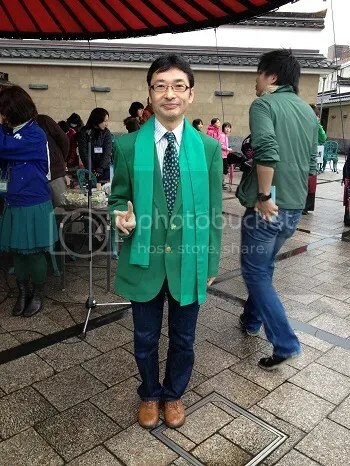 Prof. Bon sporting a very green look! Ironically he’s standing directly in front of the relief of Lafcadio Hearn on the wall in the background. While there are diplomatic sides to this event, it’s pretty much a big party and a good excuse to dress up. What better day to wear shamrock-patterned green rainboots? Among other things. 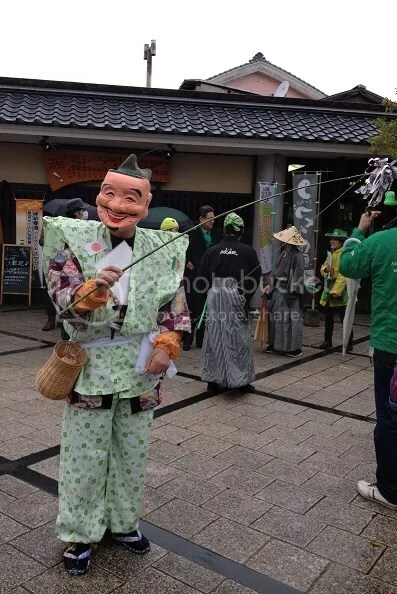 Ebisu, one of Japan’s lucky and mirthful gods, whose lead shrine is in Mihonoseki, part of the Shimane Peninsula. He’s decked himself out in shamrocks for the occasion. 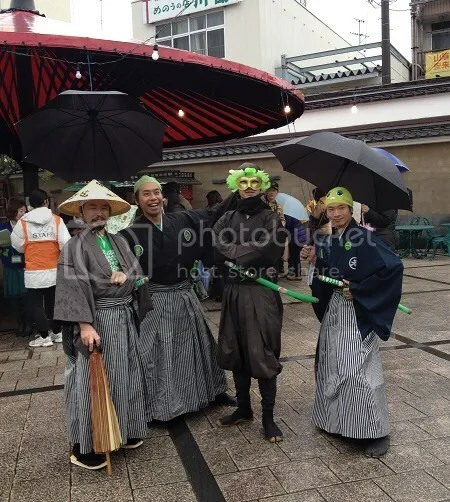 They had katana umbrellas! I always wanted one of those. There were properly dressed bagpipe players! I just didn’t get any other pictures besides this one before the parade. When I asked the father of this One Piece family if I could post this picture, the boy in front yelled, “Yeah, go ahead!” right away. This high school band is looking pretty snazzy. A Muppet? 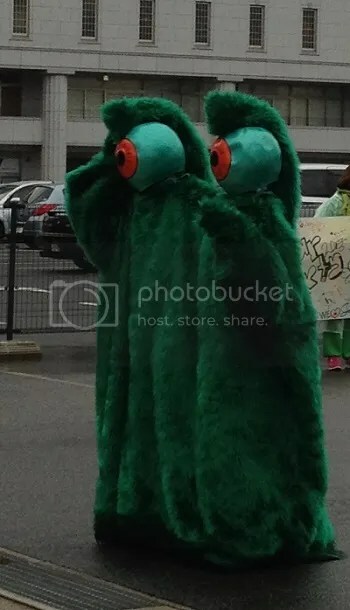 Gumby? Numemon? Well, it’s green, so it’s in the right place. 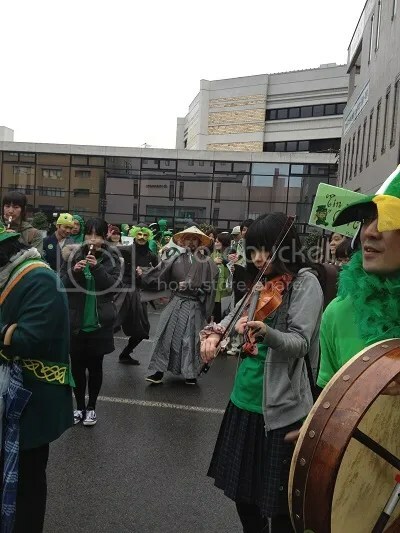 I was busy carrying a sign for the traditional Irish music group Prof. Bon and his wife Shoko-san run, so I didn’t take any pictures during the parade itself. 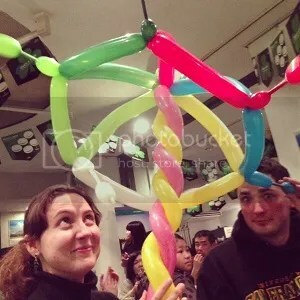 You can check out more of that on our Irish CIR’s blog with Jinjer Templer’s photography. 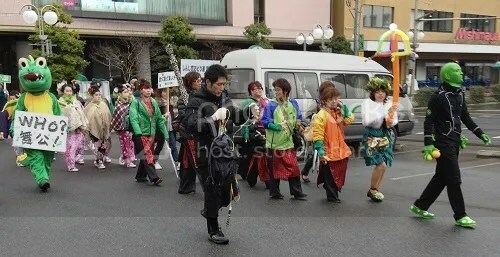 Being in the parade myself, however, I got to see things like a samurai and a ninja performing a jig while waiting to go down the street again. Besides the parade on Sunday, there were vendors selling Irish-ish food and otherwise (green crepes must count for something, right? 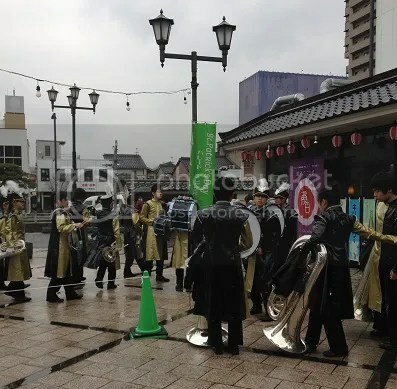 ), there was a performance contest and a Ceili dancing session–complete with a promotion character that looks like ice cream dancing in costume. Click below for a 38 second clip of this, taken by St. Patrick himself. 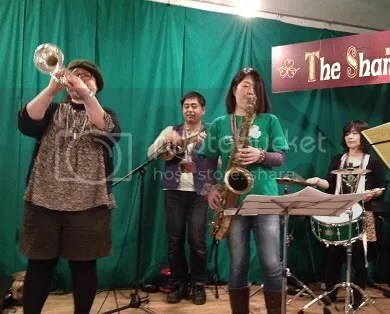 This isn’t the whole big jazz band–they also had a vocalist who did a pretty impressive Louie Armstrong impression. 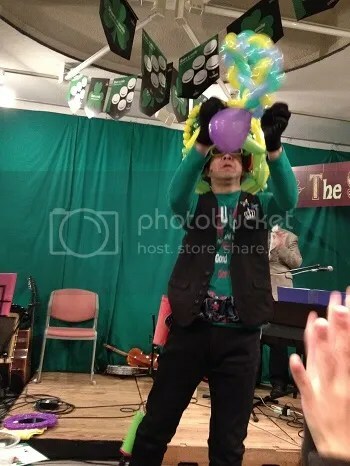 Besides playing musical instruments, he also works magic with balloons. 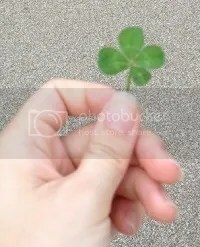 Speaking of Irish ties in Matsue, I discovered my first four leaf clover last August on my way to my welcome party.